Clown: Don'tcha just love obama?! Way to go, Marge! You haven't lived til you've sprayed a clown with an Acme mini shaving cream slash fire extinguisher. Easy for you to say, Mel. We never got to go home to find Anne Bancroft waiting for us in the sack. You have to be NOISY? 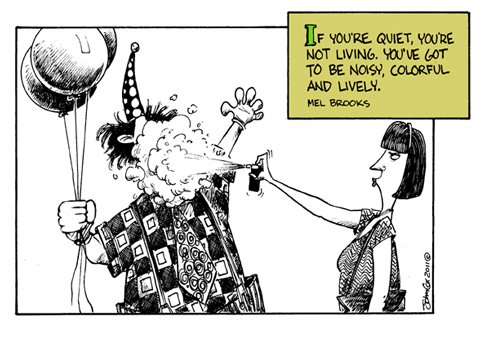 No--being noisy just makes you a punk. There are all sorts of momes riding around in boom-cars in a complete stupor (NOTE TO BOOM-CAR OWNERS: Playing lousy "music" LOUD only makes it worse). (Q) Why did they invent sport bikes? (A) So a__holes wouldn't ride Harleys. (Q) Why did they invent straight pipes? (A) As a fail-safe indicator so that if a__holes did ride Harleys, they'd be easy to spot. I think she's using BUFFOON-B-GONE. Comes in "Pig Sty" or "Brooklyn Sewer". Hey, T. A great way to handle a Boom Car at a traffic light is to have an equally obnoxious sound system-roll down the window-turn the volume all the way up-play banjo music. Nah, I've got a tape of bagpipe music - "Scotland, the Brave" drive 'em nuts! As for clowns, they're a sinister lot. Best to keep a sharp eye on 'em. Anybody who smiles that much, gotta have a sick mind. Ah, the old "mace in the face" trick. "Morning mam. Isn't it a beautiful day?" This page contains a single entry from the blog posted on August 8, 2011 1:10 PM. The next post in this blog is Planet of The Oops.